It’s a new dawn. A new day. A new life. A new … everything, and it’s stressing me out. To take some of the pressure off my shoulders, I’d hired a part-time assistant at the flower shop. It wasn’t working out quite the way I’d planned. In just two excruciating weeks, she’d managed to flood the walk-in cooler, break the coffee machine, and total my brand-new delivery van. Lizzie Hartwell was a sweet, well-meaning girl with an interest in floral design, an easy smile, and—until a week ago—a clean driving record. I was new to being the boss lady and hadn’t yet found a gentle way to let her go. At the same time, summer was here, and I was in desperate need of an extra set of hands to help get me through wedding season—regardless of how clumsy they might be. When the sound of shattering glass caused me to drop the birds of paradise I was placing in a large-scale tropical arrangement, I started to rethink my Ms. Marshmallow stance. “Sorry!” Lizzie called from the front of the shop. “Another one bites the dust,” Gwen said from her place at the front counter. She was snooping through the computer that pulled local and online orders. “You’re the one who recommended her!” I hissed to my ghostly gal-pal. I sighed. It wasn’t her fault. As Beechwood Harbor’s gossip queen, she buzzed through my flower shop on a daily basis to see who was sending flowers to whom—and why. Then she carried the scoop back to the Lucky Lady Salon, where the primo gossip percolated. When Lizzie had answered my help-wanted ad in the local newspaper, Gwen signed off without hesitation. Still, I couldn’t blame her for missing the shy girl’s utter lack of hand-eye coordination when there was so much hot gossip zinging around. No, at the end of the day, hiring Lizzie had been my call and I’d have to live with it, at least until I could woman up and let her go. Or until she burned the shop down and I no longer needed an assistant. “I don’t think so,” Gwen said, drifting away from the computer. She doesn’t know the meaning of rhetorical. “Yeah! I’ll get it all cleaned up right away!” came the frantic reply. I drew in a slow, cleansing breath. “When I hired an assistant, I didn’t realize I needed to have padding installed on the floors. I also didn’t think that she’d be assisting me by putting my van in the body shop for a week,” I whispered to Gwen. “Tell me about it,” I grumbled, unable to match her level of enthusiasm. Truthfully, it was all a smidgen overwhelming. I’d gone from a wanderlust world traveler to a one-woman show under the microscope of a tight-knit community that seemed to be closing in on me a little bit further each day. In the past two weeks alone, I’d been forced to quick-talk my way out of three separate offers to set me up on a blind date. The locals wanted to get to know their newest resident and it appeared that the more I tried to close the door, the harder they were willing to push. All of that was more than enough to keep me just inches from the brink of losing my sanity, but then the ghosts got involved and things went from barely manageable to circus-monkeys-loose-in-department-store crazy in two seconds flat. “You okay, Scarlet?” Gwen asked when I started massaging my temples. Lizzie was not gifted/cursed with the ability to see ghosts and stood, wringing her hands, as Flapjack handed down his sentence. Flapjack made a sneeze-slash-cough sound that clearly communicated he thought I was being a pushover. “From what? Face masks and terrible rom-coms?” Gwen asked, barely able to contain another laugh. “I was talking about her first date,” he replied, swishing his tail. Lizzie came around the corner before I could further question my self-appointed, pint-sized guardian. That was the other downside to having an assistant hanging around—it made talking to the ghosts nearly impossible without looking like a raving lunatic. Gwen gave me a pitying look as my finger hovered over the illuminated button for a moment longer. Finally, I clicked onto the line. Silence greeted me on the other end. Gwen looked past my shoulder and her expression darkened. The bell on the front door jangled and my shoulders fell. I didn’t need to turn around to know who had just wandered into the shop. While I agreed whole-heartedly, I kept my smile buttoned up tight. I couldn’t verbally agree with Gwen for a couple of reasons. First, because she’s a ghost. Secondly, because Kimberly Gardner was a client. An incredibly important one. She was the first bride-to-be at the newly opened Lilac Bed and Breakfast, a historic home that I’d become entwined with a few months earlier. Let’s just say there had been one seriously pissed off ghost in residence during the renovation and without my help, the entire house would have ended up in a crumbled heap of rubble. Thanks to my help with the spooky situation, I’d earned the exclusive rights to provide florals for all events, including Kimberly Garner’s upcoming nuptials. Yay me? Oh, and the whole thing was going to be on TV, adding another few degrees to the pressure cooker I found myself living in. The Lilac B&B’s renovation had been featured on a popular home improvement show, Mints on the Pillows, which resulted in a flock of bridezillas looking for a slice of the limelight when the show returned to film a special segment on the venue. Enter stage left: Kimberly Gardner. She was by far one of the most demanding, entitled women I’d ever met, and thought for some delusional reason that her nuptials should be on par with something from the royal family across the pond. I honestly wasn’t sure why she wasn’t throwing her wedding in some kind of swanky Los Angeles hotel or on a tropical beach somewhere. Beechwood Harbor was a lovely town, tucked along the rustic Washington State coastline. Lush greenery collided with the majestic ocean, separated only by miles of sandy beaches. It was a beautiful place to have a wedding, but it wasn’t quite up to the standards splashed through the newsstand’s worth of bridal magazines that Kimberly was armed with 24/7. Rumor (Gwen) had it that Kimberly was a huge fan of the show and that her family had paid nearly triple the asking price to have her wedding be the christening event for the B&B’s outdoor venue. To say the wedding was going to be over the top would be the understatement of the decade. “Are you even listening to me?” Kimberly snapped. “Well?” Her overly plump lips protruded into a duck pout. Had she had more work done since her last visit? “I’m not normally a violent person, but this woman has me wishing I had the use of my hands,” Gwen said, pantomiming a strangling motion at the woman opposite me. “If I had the use of my claws, I’d join you,” Flapjack said, jumping up onto the counter. I rolled my eyes, only realizing a moment too late that Kimberly wouldn’t understand why. “Is there a problem?” she asked, crossing her arms. Yeah, that’s right. Her fiancé’s first name is Casper. I nearly spit out my coffee when I’d taken the order. My plan worked; Kimberly took on a certain glow anytime she heard the phrase Mrs. Casper Schmidt, and it tended to knock her down a few pegs from homicidal. The effect would strike me as adorable, perhaps even enviable, if she wasn’t such a ginormous pain in my rear. Kimberly’s phone rang. She waved a finger, shushing me before ripping it from the outside pocket of her purse. “Where are you?” she barked without so much as a hello to the person on the other end. She paused and her expression darkened. “Quick, Scarlet, hide anything pointy and sharp!” Flapjack warned. “She is looking kind of … stabby,” Gwen added. “Shush,” I whispered, waving a hand at both of them. It was hard enough for me to keep up my unflappable routine without the pair of them hissing in my ears. Kimberly ended her phone call with a snarl and slam-dunked her phone back to the depths of her beach-tote-sized purse. She turned back to face me and managed to find her smile, though it didn’t quite reach her hazel eyes. The woman was nearly airbrushed perfection with a pulse. Everything from her skin to her glossy chestnut hair and her perfectly manicured fingernails was tended to and maintained. I had a feeling that the monthly receipts from her boatload of beauty products would add up to more than I made in a quarter. How she maintained such a sunny disposition in Kimberly’s near-toxic radius was beyond me. “Hello, Sonya.” The smile I offered her was genuine. “Drea is late, as always,” Kimberly complained. Her insufferable whine was like fingernails on a chalkboard. Kimberly frowned, unhappy to be out of the center of attention. “You’re sure you can do this?” She eyed me, both of her painfully perfect brows drawn into sharp peaks. “Ugh, give it a rest already!” Flapjack groused. Without another word—never mind a thank you—she turned and stalked out. “I’m really sorry about her,” Sonya told me as soon as our shared little ball of sunshine was out of sight. Her bright smile faded and for the first time since meeting her six weeks beforehand, I realized that she was just as fed up with Kimberly’s theatrics as I was. For some reason, that made me feel a little better. Misery loves company, after all. “No wonder her sister avoids her at all costs,” I said, my voice lowered. Sonya waved as she headed out and I returned to my studio. Flapjack and Gwen followed, complaining about Kimberly’s treatment of me for a few more minutes. They kept at it until Flapjack left to go revel in the stink wafting from the catch of the day as it was being cleaned down at the harbor docks. Gwen had a semi-unhealthy obsession with my love life. Granted, she had the same fixation with nearly everyone in town, I was simply one of the few corporeals that she could talk to. I returned to my studio and dove into work without commenting. “You’re really not going to tell me anything?” Gwen asked. Gwen’s silvery silhouette shimmered and then vanished without a sound. Somehow, Lizzie and I managed to squeeze the three outgoing orders into her clown car and I sent her off before returning to my arrangement. For the first time in a long time, the studio was quiet. By the time Lizzie circled back near closing time, I’d rearranged the cooler, cycled out all of the old product, and cleared out the voicemail queue. “How’s tomorrow looking?” I asked Lizzie as she consulted the schedule on the front computer. “Busy,” she replied in an almost apologetic tone. She grabbed her purse and car keys from the small office and slipped out the back door with a small wave. I went to the counter, eager to take care of the last customer so I could close up. Despite my cagey response to Gwen, I was looking forward to seeing Lucas again. More than I was willingly to admit. He was flying into SEA-TAC and making the three-hour drive into Beechwood Harbor in a rental car. He’d assured me that he would make it in time for a late dinner. “Selecting the right flowers?” I asked, cringing because I already knew from his posture he wasn’t there to pick up a bouquet. 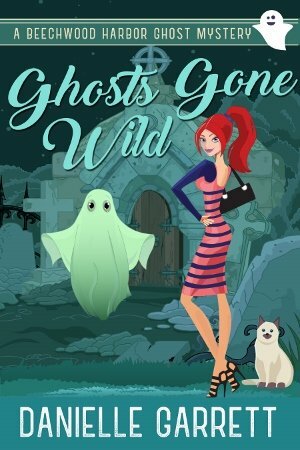 Ghosts Gone Wild will be available in the next day or two, be checking your inbox for the official announcement the moment it goes live on Amazon! So very good! Can’t wait. Getting to know my new neighbor! This was fun, I think it was the cover and title that drew me in. Does it matter if I start with 1st or just jump in and start with this one?